Due South was another favourite of mine in the 90's. I liked Benton Fraser and Ray Vecchio – I think they were one of my first favourite ‘buddy cop teams'. I was fairly young when the Ray changeover happened (from David Marciano to Callum Keith Rennie), so I didn’t quite ‘get’ what was going on (I think I was as perplexed as Fraser was). It didn’t help that the first episode with New Ray began like nothing was wrong/out of place/different. I thought I’d missed an episode or something. It’s so long ago now, I can’t really recall what my initial reactions were other than confusion. I must say that I didn’t take to Callum Keith Rennie’s New Ray straight away. In fact, it probably took me a good long while to warm up to his character and I really missed Old Ray and his dynamic with Fraser – so much so that I think I was hoping he’d return and we’d get the old duo back. However, by the series’ end, funnily enough I’d grown fonder of New Ray and his dynamic with Fraser. Sure, it was different from Old Ray and Fraser’s dynamic, but over time I guess I’d gotten used to it, because by the time Old Ray returned, I was feeling very conflicted about it. On the one hand, I was very happy to see Old Ray and Fraser back together again, as I’d missed that for a long time. On the other hand, I did feel a bit sad for New Ray when it seemed like perhaps he’d be forgotten about because Old Ray had resurfaced and I didn’t like the idea of Fraser just forgetting about New Ray and the friendship they’d formed (then again, I would’ve hated for him to have forgotten his friendship with Old Ray too). So, really, I wasn’t wanting either Ray to be forgotten about or ‘chosen’ over the other Ray – which was kind of a funny reaction from me, given that usually when one character replaces another in a show, I have a clear favourite/one that I prefer over the other (then again, I’ve seldom been in the situation that Due South presented me with). Considering when New Ray first turned up, I couldn’t have fathomed liking him and not wanting Old Ray back with Fraser, I was surprised with myself that my reaction to the end of the show was one of contentment. I was fine the way it ended with Fraser and New Ray, but was glad Old Ray came back for the end of the show. It’s a peculiar case that I haven’t ever found with a show since, and I’ll always remember the unique roller coaster of feelings/emotions I went on regarding the two Rays. I loved Diefenbaker, Fraser’s deaf wolf, and I also thought that the music used in episodes of the show was really great. Numerous episodes had some really good quality songs used in the background, which accompanied the scenes perfectly. Plus, I loved the Due South opening credits. The credits are awesome. The music, the choice of shots, just the ‘mood’ of it was perfect for the show. There's so many great shots included - Fraser with the gun, Fraser making Ray wait to get in the elevator so the other person can go first (showing Fraser's politeness/consideration for others), Fraser tasting something off the ground and Ray being grossed out (Ray's face is great, and we know Fraser did this a LOT throughout the series), Fraser slow-mo falling out the window from explosion - it summed up the show/the show's tone, the character of Fraser and his partnership with Ray. If I had to pick a favourite shot, the one that immediately comes to mind is Fraser turning Dief's head to look at him and telling him to "Stay." - I was just happy to see Dief included in the opening credits in several shots (as he should be!). Every time I hear the tune, I feel nostalgic for the show. The theme tune also has a slightly sad/haunting feel to it at one point as well, I think. It’s hard to explain. What I kind of hated, though, was when they altered the theme music somewhat in the later seasons. It just kind of ruined it, I felt. Whatever they added to it just didn't do anything for me and I found it annoying. I do enjoy the end credits too, though I hadn't really taken as much notice of them when I first watched the show on TV way back when I was growing up. Many years later on DVD, however, I had the chance to really look at them and notice the part where Fraser falls over at the end. I was also quite surprised when I eventually read somewhere that Paul Gross did the singing over the end credits. I'd never known that previously. Anyway, please feel free to post any fond memories you have of the show. I watched the show too and own all the seasons on DVD. It was one of my Aunt and Uncle's favourite TV shows in the 90s and I remember hearing it was cancelled by the American network it was on and it moved to Canada on another network and continued for another two seasons and I haven't heard of another TV show that has been able to pull that off. an underrated classic for sure! Well, I’ve started rewatching Due South from the beginning on DVD after having not watched it in quite a long time. Yes, it’s very 90’s (the mobile phones which are almost like bricks never fail to amuse me – both in this and The X-Files), but still very enjoyable. It was evident that they changed dogs who played Diefenbaker in between the ‘Pilot’ episode (which was more like a mini movie) and the next episode, but not particularly bothersome. I do like the ‘main’ Diefenbaker that we got after the ‘Pilot’ (though I still hated seeing original Diefenbaker shot/hurt in the ‘Pilot’ episode – and I know that’s not the last time that happens to him either. It was the one thing I always worried about when watching – seeing Dief get hurt). Fraser and Ray’s dynamic/chemistry was evident right from the start. Paul Gross goes all-in with portraying Fraser as the genuine do-gooder and Ray’s snarkiness contrasts nicely and allows for many great quotes/moments/scenes. 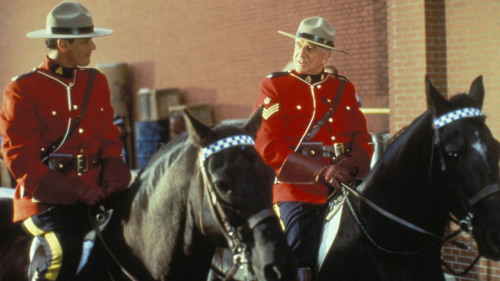 Also, in the most recent episode I watched (titled ‘Manhunt’ and featuring Leslie Nielsen as legendary Mountie Buck Frobisher), Fraser got knifed in the leg (which was very painful to watch), but he wouldn’t let his boots be cut open at the hospital. It was nice to see Ray so concerned for Fraser. As mentioned, they formed a friendship quickly, but it was completely believable thanks to both actors. Fraser: You ran away, but you brought your dress uniform with you?" Frobisher: "No, I rented it. If we don't catch him by Tuesday, I have to pay extra." Frobisher: [to Fraser] "You track a man about as quietly as I pass wind." Fraser: "It's nicotine, all right. I see it." It was interesting seeing Leslie Nielsen play more ‘serious’ in the episode, after all those Naked Gun movies he was in, but I thought he and Paul Gross really sold the history between them and Fraser’s dad’s friendship with Frobisher. Although, Leslie Nielsen did get to have some comedic/slapstick moment (like the gag with him falling off the horse and bike when they would rear up). Though it paid off at the end, when he managed to stay on the horse finally. I’m enjoying rewatching the show (it’s better than a lot of stuff that’s on TV here at the moment). The theme music (as well as the music used throughout the episodes) is just as good as I remember it. Watched some more episodes recently, and it was interesting to see a young Ryan Phillippe and Mark Ruffalo appear in them. I also recognised the actress playing the teenager, Christina, who Fraser had to guard in the 'Chicago Holiday' two-parter as the daughter from Mrs .Doubtfire. And the episode I watched had some songs which I really liked (they were used really well in the episodes and certainly set the mood). Just watched episode 15 of Season 1, titled 'The Wild Bunch', tonight. As someone who is fond of animals, I found it a somewhat upsetting episode, as it involved the threat of Diefenbaker being 'put down'. It all started because he had gotten himself a Husky girlfriend named Maggie and was running with a motley crew of other canines. 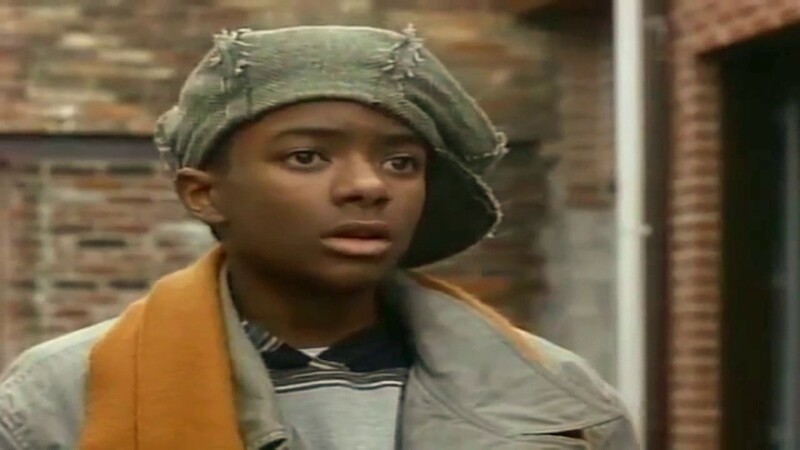 The character of Willie returned (after being introduced at the beginning of the season) and was charged with keep an eye on him. Unfortunately, he let Dief get out and he ran afoul of animal control officer who we later discover is stealing animals and selling them off to be tested at labs and so on. This was one of the rare occasions where I didn't like Fraser. 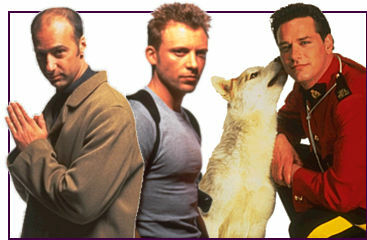 I mean, Paul Gross did a wonderful job of portraying Fraser's feelings regarding Diefenbaker and that talk he has with him in his 'cell' shows just devoted he was an an actor to portraying the character of Fraser and his connection with his wolf. He plays that scene just how he would with another actor, I think, and totally sells it. However, I was pretty mad at him for not trying harder to free Diefenbaker. Heck, Willie was trying harder than him - but, of course, Fraser's all about sticking to the 'law' - which is usually understandable, but I just wish he had seemed even half as broken up about Diefenbaker's situation as I'm sure most of the audience were (while I can't recall my first viewing of the episode back when it aired on TV - as it was so long ago - I'm sure at the time I was pretty worried for Diefenbaker). And while usually Fraser's do-gooder nature/always telling the truth allows for amusing moments, it kind of dug him deeper and deeper into a hole he couldn't get out of during the courtroom scene. In this instance, I wished he'd shown some restraint regarding letting all these facts about Diefenbaker spill out and consequently get him condemned by the judge. We do see Fraser show emotions regarding his feeling he has to put Diefenbaker down (it's rare we see that sort of emotion from him), but it made me mad that he even contemplated shooting Diefenbaker, even for a second - yes, Diefenbaker had slightly injured him, but he should've known Dief would never harm him intentionally/without cause (as he told Ray throughout the episode in regards to wolves and their being misunderstood). I did find it a bit annoying that they tried to draw parallels between Ray losing his car last episode and the prospect of Fraser losing Diefenbaker - a car and a beloved pet are two totally different things. I was glad that Ray acknowledged this and said that Diefenbaker seemed like he had a person inside him. Some people just don't understand how human-like animals can be (and quite often are better people than actual humans are). Random observation: Ray got to say Fraser's usual "Thank you kindly, Elaine." in the episode. 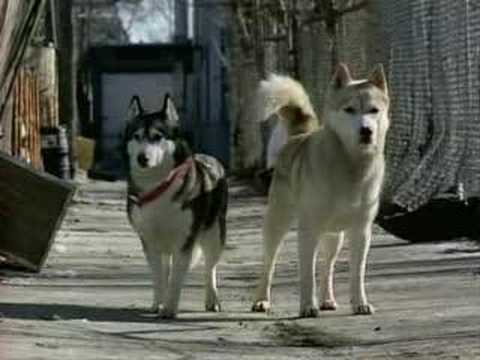 It was upsetting to see the dogs locked up in cages, muzzled and especially near the end when Diefenbaker was running and Fraser was preparing to shoot him - I didn't care what his reasons for it were, I hated him in that moment. Thank goodness the sight of Diefenbaker's girlfriend and Willie stopped him. After everything Diefenbaker's done, I would've thought he'd earned being given a fair chance. It was sad to see him and Fraser on the 'outs' and him even mildly hurt Fraser, but at the same time it was super frustrating that Fraser couldn't see/understand everything Dief did was for a reason. I did like that Diefenbaker got so much focus in the episode - I just wish it had been under better circumstances. I imagine when I first watched this episode on TV so long ago, it would've been super upsetting as I wouldn't have known what was going to happen, whereas this time around I knew he'd be okay (though it was still pretty sad). On the plus side, at least things worked out in the end...plus, we got to see cute/adorable puppies! This was the other instance of me not liking Fraser much - due to the fact that he was so 'blinded by love' for Victoria (Melina Kanakaredes). I kept that they had history and she was the one woman he 'loved'...but SHE SHOT DIEFENBAKER! The alone should've been reason enough for Fraser to arrest her, lock her up and throw away the key. As polite/courteous as Fraser usually is, it's always bugged me how he's rather 'rude' to Diefenbaker and doesn't treat him with the same overly-polite manner as he does everyone else. He argues with him, makes snarky comments at/about him and doesn't even seem to care as much as he should when Dief gets hurt (who has now been shot *twice* - once in the first episode of the show and now here at the end of the first season). Obviously Fraser *did* care somewhat about Diefenbaker, given how he reacted when he heard the gunshot, ran in and found poor Dief lying there, seriously hurt. He picked him up immediately (I was so glad to see Ray instantly ready to take Dief to get help - as much as he might pretend not to like him much at times, I think he's come to care about him). Detective Gardino even showed a hint of caring about Dief's welfare when at first he made the crack about paw prints, but then caught himself and asked Fraser how Dief was doing. And it was nice of Detective Huey to apologise to Fraser for having to place him in handcuffs - those two who always gave Fraser/Ray a hard time have softened a bit towards Fraser, which is good to see. Though I felt so sad for Dief, being left alone, wounded, in a cage. It was very upsetting seeing him this way. I just could not get past Fraser overlooking this crime and still wanting to be with Victoria. Clearly he was only thinking with his downstairs brain. Which brings up the subject of...Fraser finally getting some. As soon as he missed work and Ray found him being all secretive about having a woman in his room, it should've made Ray think something was seriously up (although he obviously already wondered what was going on when Fraser was late for work). Still, Diefenbaker seemed to be the only one who saw Victoria for who she was. Fraser was blind to her, and Ray really wasn't being as forceful as he should've been in telling Fraser to stay away from her and let him arrest her. Only Fraser's dead father had the sense to ask why he'd even want her to return to him. As if I didn't hate her enough for hurting Diefenbaker, Victoria's other major crime was turning Fraser into a lovesick sap. 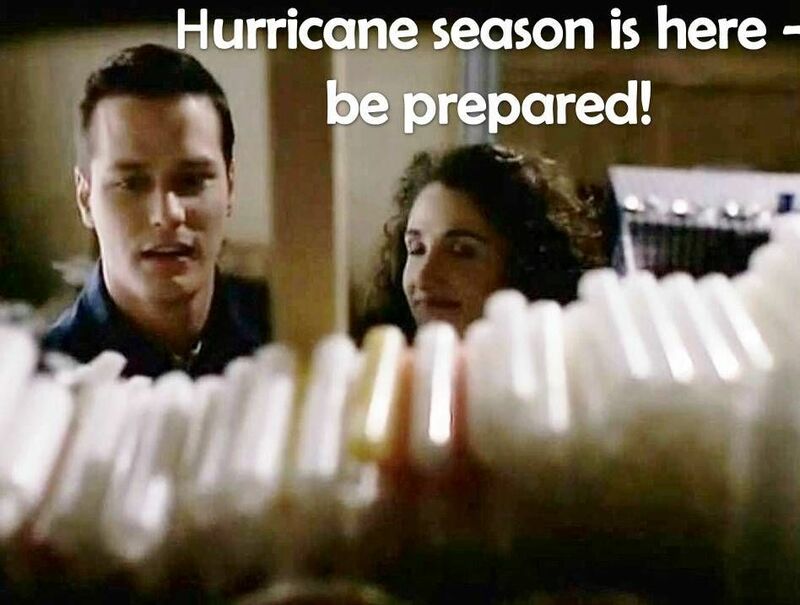 I mean, seriously...all those candles? Potential fire hazard alert! Part 1 wasn't particularly fun at all, not only because of the Diefenbaker shooting, but also because the majority of it was just Fraser and Victoria being all over eachother. I'm not opposed to romance in shows. In fact, while most people seem to complain about it, I'm usually fine with it. However, Fraser was usually so smart about things, it was very frustrating to see him so blinded by 'love' and not acting himself. That was the other thing that made this two-parter unenjoyable - the fact that Fraser was so un-Fraser-like/not himself. Truly, the most freaky thing ever was the old lady coming to Fraser for help in catching someone who'd stolen her purse and him saying he couldn't help before driving away and leaving her. That was downright scary, as it was completely the opposite of how Fraser is the rest of the time. And it wasn't just Fraser who felt different - the two episodes as a whole had a more serious tone/'feel' to how they usually seemed. Most of the time they had a bit of 'goofiness' to them mixed in with some 'serious'/emotional' moments, but these two episodes in particular felt like they toned down on the super-politeness of Fraser, the silly stuff and ramped up the emotional/serious stuff. There was very little humour, and what humour there was seemed more 'subdued/low-key' than usual. The playing pool table stuff was mildly amusing, as was Fraser Sr. and his hat/eating/having conversations with Fraser that no one else could see or hear (and it's also funny that Ray has the same thing going on with his deceased father too). I will say that the episodes looked amazing. The snow and the lighting really added to the atmosphere. There also seemed to be a lot more shadow than I recall there usually being. The music choices, as usual, were perfect. They add so much to the show. No wonder there was an album released with music from the show - it would've been pretty great, I think. Apart from the Diefnebaker shooting, the other part I always remembered about these episodes from when I first saw them on TV when I was quite young...was the ending, with Victoria on the train and holding out her hand for Fraser to join her, Fraser (stupidly) running after her, pulling himself up to join her on the train just as Ray was shooting and consequently getting himself shot in the back. While I felt badly for Ray, I can't feel to bad for Fraser considering what a dope he was being the whole time. Because it can't be said enough: SHE SHOT DIEFENBAKER! Why in the world would he ever even contemplate wanting to be with her after that? I know he had his own reasons, but it just made him look like a lovesick fool. Anyway, I'm glad I'm past those episodes now (and, as far as I recall, Diefenbaker doesn't get shot any more times - thank goodness!). 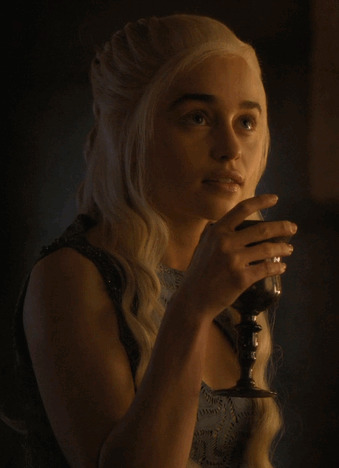 I think I like the next episode a bit more (though I only have a vague recollection of it). I know Fraser is mad at Ray for shooting him, but he should understand it was an accident. And as I said before, given how Fraser was acting, and the fact that he let a criminal get away, he could be a bit more understanding. As nice as the episodes were to look at and listen to the soundtrack to, and as well-acted as they were (Paul Gross was especially good in his monologues and showing emotions from Fraser we weren't used to seeing), I can't say that I really 'enjoy' these two episodes. Objectively, I can tell that they were well done, but they're not personal favourites of mine. Still...it made for one heck of a cliff-hanger (and, unlike a lot, was pretty unexpected - since how often does one lead/hero of a show shoot another lead/hero of a show in the back...albeit unintentionally?). And now I've watched the last episode on my Season 1 DVDs, 'Letting Go'. I felt bad for Ray, when the episode begins with them rushing Fraser into hospital and Ray's clearly concerned over his friend's well-being. Of course, all Fraser's still thinking about is Victoria, which was rather eyeroll-worthy (he needed to make like the episode title and move/'let go'). Poor Ray was obviously feeling guilty about accidentally shooting Fraser and trying to make it up to him. Fraser was still annoying me with his obsessing over Victoria and not being overly sympathetic towards Diefenbaker (who'd also been shot). I know not many would probably agree with me, but I liked seeing Laurie Holden as nurse Jill Kennedy. She was so different here than she was in the role I mostly know her for - Marita Cavarrubias in The X-Files (while I did see her in The Walking Dead, she'll always be Marita to me, as I really liked her in that role. Though, unlike most, I also liked her as Andrea in TWD). She was so serious in that show, hardly ever smiled and had a particular way of speaking, whereas here she was all smiles, fun and enthusiastic. Plus, every time Fraser brings up the wound he sustained when someone swung a dead otter at him, it never fails to amuse. I thought she played well off Fraser and brought out a different side to him. If it'd just been him and his wallowing, it wouldn't have been a very enjoyable episode. It was also fun to see his ghost dad back to randomly appearing - and it odd places too, like the pool Fraser was in with Jill. After the last two episodes being super serious, it was nice to get a bit of the 'goofiness' back (such as Fraser Sr. appearing in the pool whilst dressed in the full Mountie uniform). It felt like a very 'different' sort of episode, with Fraser in bed and featuring in his own version of Rear Window, spending most of his time having Jill try to get him involved in the mystery of what was going across the street with the people they were spying on. I liked the continuity with an earlier episode in the season which had established Diefenbaker was transfixed by blonde American women. I loved the bit where Jill tossed him a burger and he caught it, then later when he was following her - it's no surprise he took a liking to her, given how Fraser had been towards him. 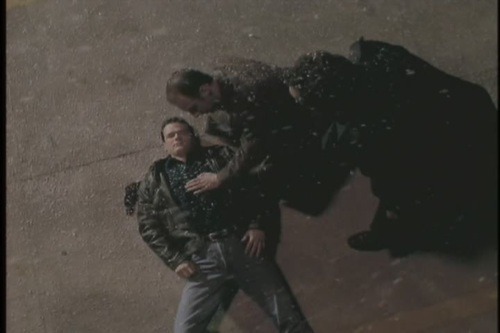 I'd forgotten that Ray took a bullet for Fraser near the end of the episode. I guess, in a way, that made them 'even' - though, really, Ray needn't have felt like he deserved to get shot, since his shooting Fraser was indeed an accident. It was strange seeing Fraser hold a grudge and be petty, but I'm glad they'd worked things out and were 'good' by the end of the episode. Now all three of them have been shot - Fraser, Ray and Diefenbaker (who has been shot twice). Anyway, Season 1 has been (mostly) a delight to watch. Here's hoping Season 2 doesn't disappoint on rewatch. I finished Season 2 of Due South today. There were some good episodes this season and some not-so-great ones, which was also true of the first season. I remember that the death of Gardino was quite surprising when I first saw it. I wasn’t expecting a supporting character to die. Of course now I realise that the supporting characters didn’t really get much to do. They did a good job giving his death some ‘weight’ and the funeral scene was especially well-done, I thought. The addition of Inspector Margaret Thatcher as Fraser’s new boss was interesting. Yes, she started off nasty (the person I was watching the show with didn’t seem fond of her either, and it was good that Ray was there to call her 'Dragon Lady', 'Ice Queen', etc - no doubt speaking for at least part of the audience in regards to Thatcher's character - as we know Fraser would never think, much less say such things), and yes it went the somewhat obvious route of her gradually coming to feel for Fraser and vice versa. Still, I liked when she started being halfway decent towards him and they had some really good moments in the episode with Leslie Nielsen this season which took place on the train. The ‘semaphore’ scene between Fraser and Thatcher was pretty amusing. I also liked that we got to see how Fraser and Diefenbaker met (it was quite amusing seeing Fraser get repeatedly knocked out, and puppy Diefenbaker was incredibly cute). It was interesting that the Season 2 final revolved around Fraser losing his memory. I typically hate ‘clip show’ episodes, but it seemed kind of ‘fitting’ that we relived memories of the two seasons and Fraser and Ray’s partnership/friendship, considering this would be the last time Fraser and Ray were together (until the series final, of course). Knowing what was coming, it actually gave the end of the episode some emotional ‘punch’ (and I liked that the end credits had the goofs/a ‘gag reel’ of sorts with the two actors). I also just finished watching the first episode of Season 3. I’d forgotten that we got to see old Ray (albeit briefly) near the start of the episode, having a phone conversation with Fraser. That was really well-played by David Marciano, I thought, as he effectively said ‘goodbye’ to Fraser for the foreseeable future. It was especially effective as we saw him leave his desk (and us, the viewers). It was actually quite a sad moment, knowing we wouldn't see him again. I’ve mentioned before that when I first saw this episode, I was as thoroughly confused as Fraser was with everyone pretending this new Ray was old Ray. It certainly took me a while to adjust. It did feel weird seeing new Ray get so angry at Fraser at times, as even when old Ray would get mad, it still seemed like he cared about Fraser. I guess I’ll have to wait and see how long it takes before I feel ‘used to’ new Ray this time around. Main negatives of the episode would be the new version of the opening credits music (I didn’t like it) and Thatcher’s new haircut. And just how many of those 'rare' cars - which Ray repeatedly lost throughout the show - exist?